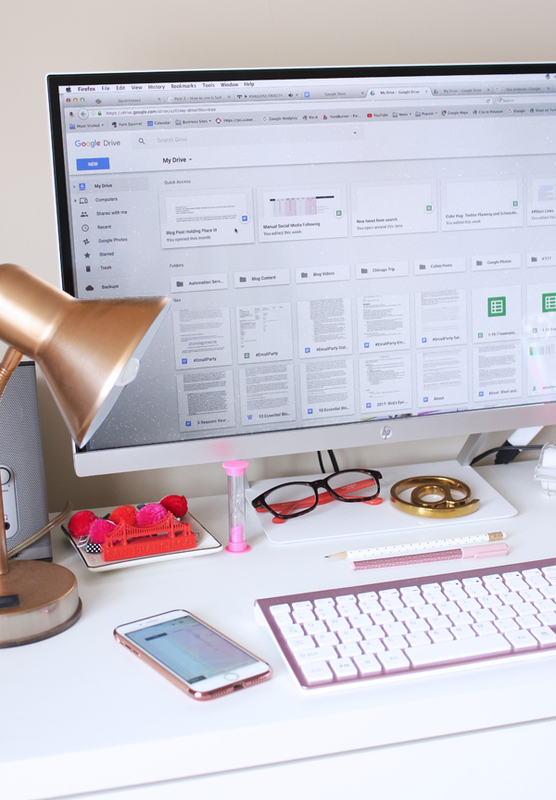 How to use G Suite as a Blogger — Lauren Myers & Co. I remember when I signed up for my first Gmail account. I was fascinated with them because they rolled email threads into one message rather than having multiple emails with the same subject on separate lines (hello organization!!). Little did I know, Google was going to have a huge impact in my life over the coming years. Fast forward to present day and you will find me using so many Google apps for so many different things. 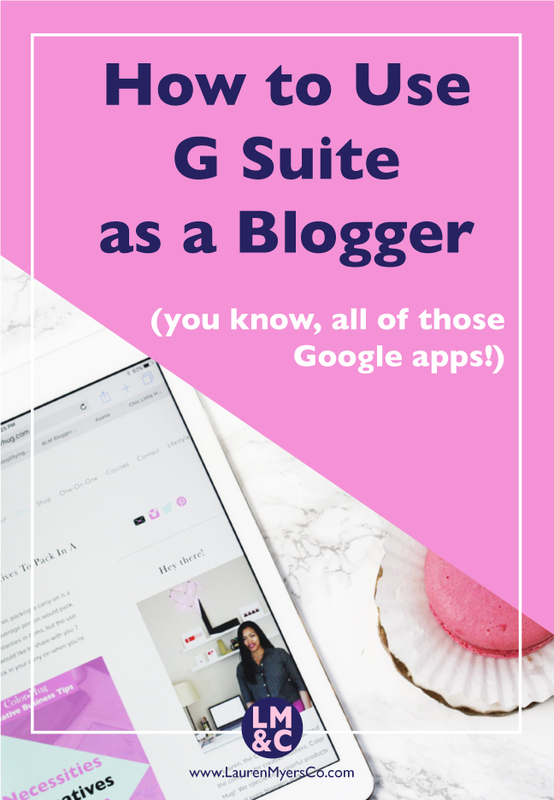 The G Suite, as it’s so lovingly called, can be a bloggers dream. There are various apps that make up the G Suite, most that I use on the regular. Today I will be discussing the G Suite and how a blogger can use the products in their blogging processes. First a little 101. The G Suite is comprised of Gmail, Calendar, Drive, Docs, Sheets, Slides, Forms, Sites and Hangouts and they are designed to integrate with each other. For example, if you want to insert a graph from Sheets into a Doc, you can easily do that. Docs and Sheets are similar and compatible with MS Word and MS Excel, so if you know these programs, the Google versions will be a breeze. The other apps in G Suite may sound familiar and you may even use them currently. The difference in G Suite from Google’s free apps is that you receive double the storage space in Google Drive than the free accounts, 24/7 tech support and you receive a business email account (you@yourwebsite.com - golden & professional!) with 99.9% guaranteed uptime. Quite honestly, the business email is the best thing of all to me, so the accompanying G Suite products are an added bonus! Organize your tweets to post for the week (bonus points for automatically adding them to Google Calendar so that they post to Twitter based on a scheduled time!). Store new email subscriber details to automatically add to a ConvertKit email list - I use the Squarespace platform for my website, but there is no direct connection from Squarespace to my email marketing provider, ConvertKit. As a result, if you use Squarespace’s newsletter or form blocks to collect email addresses, to get them to flow to ConvertKit automatically, a Google Sheet would need to be the bridge between the two. Social stat tracking- Sheets is a good place to keep a record of your social media numbers so that you can see trends over time. Graphs- if you are tracking social stats, create a graph so that you can visually understand the trends and know which platforms outperform each other for you. Compose blog posts- I always create my blog posts is Google Docs before moving them into my blog editor. It’s one of the best things that I do to increase productivity. Here’s a post all about using Google Docs for blog posts. Blogging collaboration- if you are working on a collaboration with another blogger, you can create and share Google Docs so that both parties can view and edit the doc. My friend and fellow blogger Katrina of Katrina Blair always use Google Docs for our collaboration blog posts and it works so well! Outline and plan email and online course content- if you create educational material, you can do your planning/brain dumping in a Google Doc. For example, when I created one of my free email courses, I planned all of the content out and edited it in Docs. Design free download content- if you offer digital freebies on your website, you can create the freebies in docs. For example, checklists, worksheets, bulleted tip lists, etc. Professional email is golden and more...professional. If you want to work with brands, you need to have a business email address to be taken seriously. I mean, there’s really nothing else to say about this because that’s the most important reason to use a Gmail business email account. In fact, here’s a link to try a free 14 day trial of G Suite (just $5 a month after the trial period! Business email is the main feature of G Suite, but the other apps come along with it for no extra charge!). Schedule tweets to post to your social media accounts - if you store your tweets in Google Sheets, you can add them to your calendar to post on auto pilot. Keep a blogging schedule/editorial calendar- Schedule blogging tasks so you will always know what needs to be done and when. When scheduling, don’t just list the day that a task should be completed, also schedule the steps that it will take to get there. Appointments- if Google Calendar is your main calendar app, you can use it for scheduling appointments. Plenty of programs integrate with Calendar so when you schedule an appointment from a 3rd party source, the event can be automatically added to your calendar. Webinars- if you want to host an informational webinar, you can do this using Google Hangouts. Private masterclass- You may be selling seats for a live video training, so you can host these with Google as well. Video calls- this can be a call with a business partner, vendor, brand, etc. If you want to have a meeting but live in completely different time zones or even just another state, video calls are awesome. My friend and I try to do a video call (virtual coffee date) monthly to plan out blogging things together. Coaching calls- if you are a coach, you can have one-on-one coaching calls with your clients. Again, this is great for working across state lines. Group calls- you can also have group calls in a Google Hangout. If you offer group coaching, this would be the way to do it. Brand images- you can access all of your brand images if it’s stored in your Google Photo account. 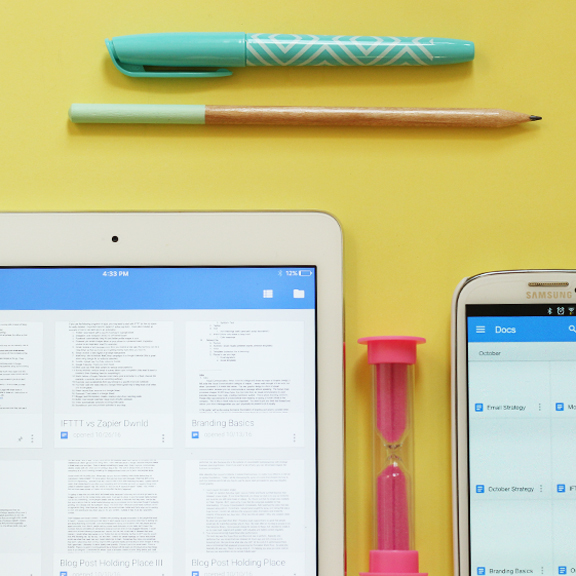 This makes it easy to access images on the go or when you need them on a whim. Save a stockpile of photos- these photos can be used for Instagram/social media posting or to create blog post graphics. They can also be used on slideshows that you create with Google Slides. Send surveys to your customers- surveys are an important piece of your blog because they give you insight directly from your customers and audience. Send surveys to your email list- surveys can also be sent to your email list for insight that will help you determine the type of content that they want to keep receiving from you. Create quizzes- quizzes are a fun tool that are also helpful for marketing because the results can tell you more about your audience and hep you tag them accordingly in your email marketing program. Webinar slides- if you host webinars, you can create the slides using G Suite. Pitch deck- if you pitch ideas to brands for collaboration, you can create a pitch deck using Slides. In-person training/presentation- when meeting with potential clients in person or for in person presentations, Slides can be used to make a professional presentation. More of it- G Suite provides 30G of storage opposed to the 15G that are standard on the free version. Folder for blog/business documents- you can create a folder to store your media kit, contracts and any other documents that you use. Now that you know various ways that you can use G Suite, I hope that you start using it more often! Here’s that link again that will give you 14 days free. After the trial, G Suite is only $5 per month and SOOOO worth it (especially for that business email account). So tell me, do you currently use G Suite? If so, how do you use it? Leave a comment below.